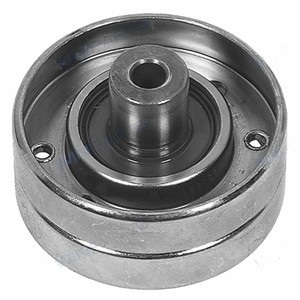 You need to replace the pulley which comes with it's own new bearing that you can't replace without your own shop. Be aware, this is a pretty vital part of your engine, don't try to save money by drilling out the rivets and replacing the bearing. Don't !! 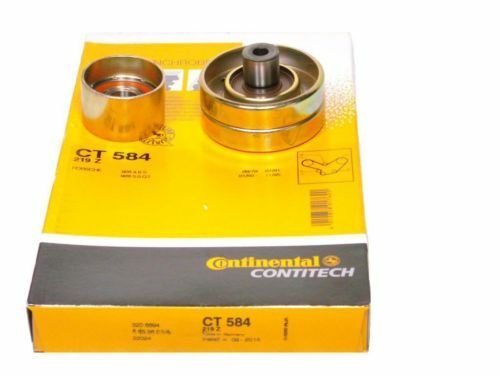 All the other T Belt pulley bearings are less crucial can be replaced without your own shop. All press into old shells. 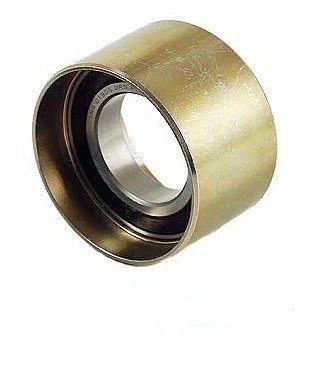 These bearings average $7 for top grade double sealed. This shows the rollers below the crank at the belt side. 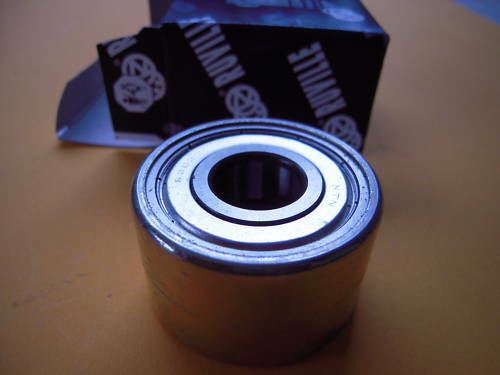 The rollers are there to avoid that the belt slips over the crank sprockets when it is loose. Normally it merely touches the belt if at all. I'm doing the water pump and belt on my 95 GTS and have a question on the lower idler. 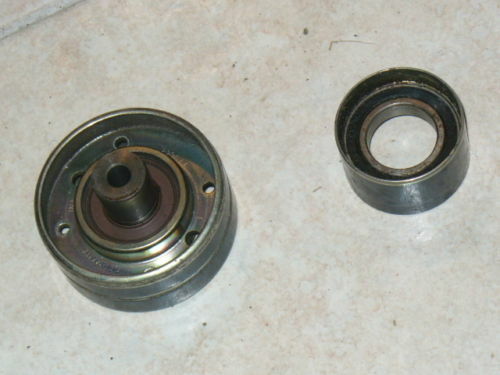 One of the carrier holes (the one furthest from the roller bearing) is elongated. This allows the carrier to 'rock' on the 2 spuds that support the carrier. This appears as play at the actual roller but it is the carrier that is not snug on the mounts rather than any roller wear. Was this elongation or 'ovality' in the hole by design? It seems too uniform to be wear! Interestingly the part no. on mine is 928 105 561 10R and not 928 105 067 01 as per PET. 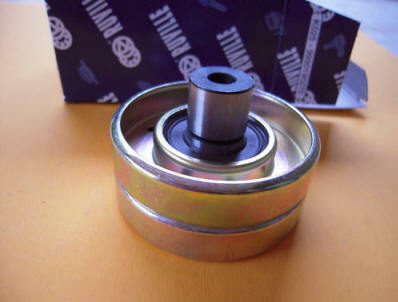 There are two of these idler roller assemblies, one with one roller and one with two. There was a discussion a year or more ago on Rennlist about the elongated hole and the consensus seemed to be that it was made that way. I can't figure any logical reason for that, except for allowing for sloppiness in the manufacture of the engine, which I don't expect. What I have done twice when I found this doing the TB/WP job is to locate the exact distance the two pins are apart that this idler rides on and then locate the roller carrier in my mill and mill the elongated hole out large enough to press in an oil-lite bronze bushing and then ream the bushing for a snug fit on the pin. I haven't had one of them apart again to see if the hole is elongating again. 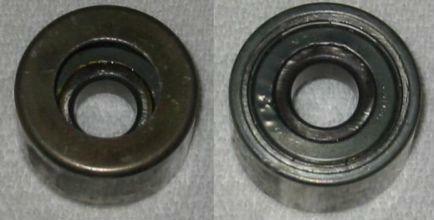 I also replaced the bearings in both of the rollers. 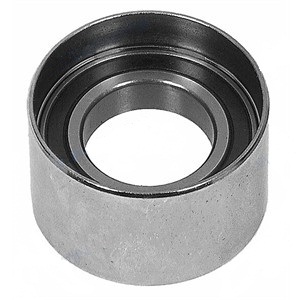 They can be sourced at the bearing store and pressed into the rollers. 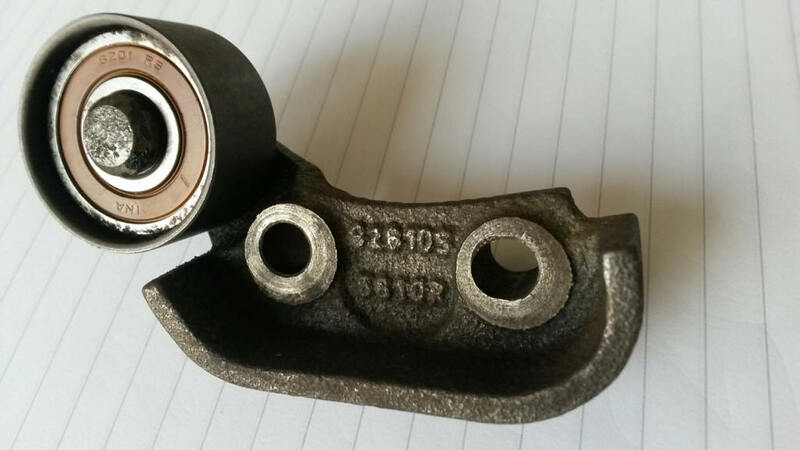 This is also true of the other idler roller on the tensioner arm, but I don't think so as to the larger roller. The assembly actually comes in 3 versions. One side is loosely attached to the block to allow it to move easily. It goes over two protruding pins at the block and it is attached on one side with a washer and circlip. So no firm attachment. More a holder to prevent slipping off. It looks to me that the roller is ok. The oval hole is on the circlip-side and probably to allow some expansion of the aluminum block and prevent it from getting stuck. No worries. Just reuse this. 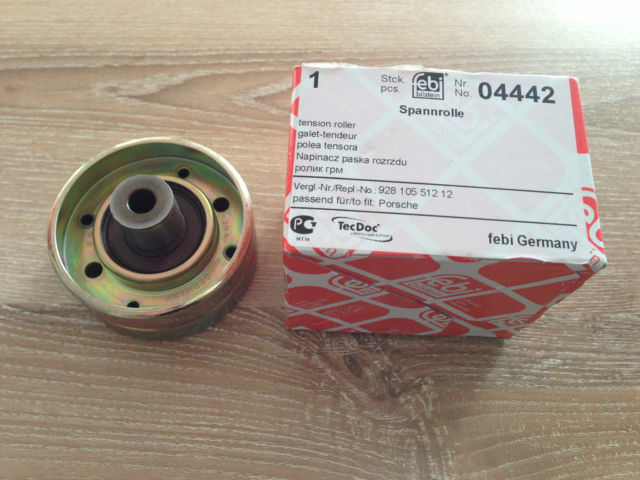 Fix the roller bearing if needed.